Why is fat important in ice cream? What is partial coalescence and what factors affect it? How is the fat phase controlled to form large fat globule clusters? Find out in this webinar with AOCS Member Rich Hartel. 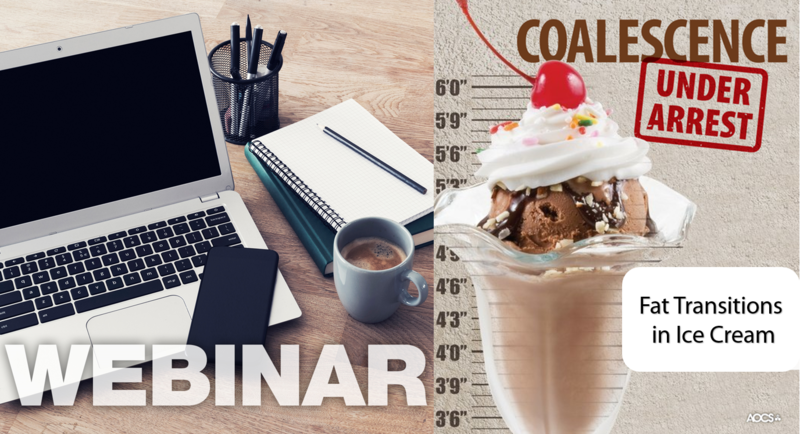 In this webinar, the mechanisms that underlie and the parameters that influence partial coalescence of fat globules in ice cream will be discussed, along with the ramifications of high or low partial coalescence on product quality. To meet the Standard of Identity, ice cream must contain at least 10% milk fat, with some premium products containing upwards of 16-18% fat. The small (1 µm) globules found in ice cream mix undergo changes during freezing, partially coalescing into large (50-100 µm) clusters of fat globules. The individual fat globules begin to share liquid oil under the intense shear forces within the freezer, but full coalescence is prevented by the network of fat crystals contained within each globule. To promote partial coalescence, it is necessary to weaken the fat/serum interface through addition of emulsifiers that displace the milk proteins. This webinar is organized by the AOCS Young Professional Common Interest Group (YP-CIG). The YP-CIG aims to bridge the gap between new and established professionals in the fats and oils industry by providing opportunities for professional development, networking and AOCS leadership. Dr. Hartel had been a faculty member at UW-Madison for 32 years, conducting research on various phase transitions (sugars, ice, fats, etc.) and teaching numerous courses on food processing and engineering. He has considerable experience in physico-chemical aspects of fats and oils, including the mechanisms behind partial coalescence. Dr. Hartel is past Editor-in-Chief of JAOCS.